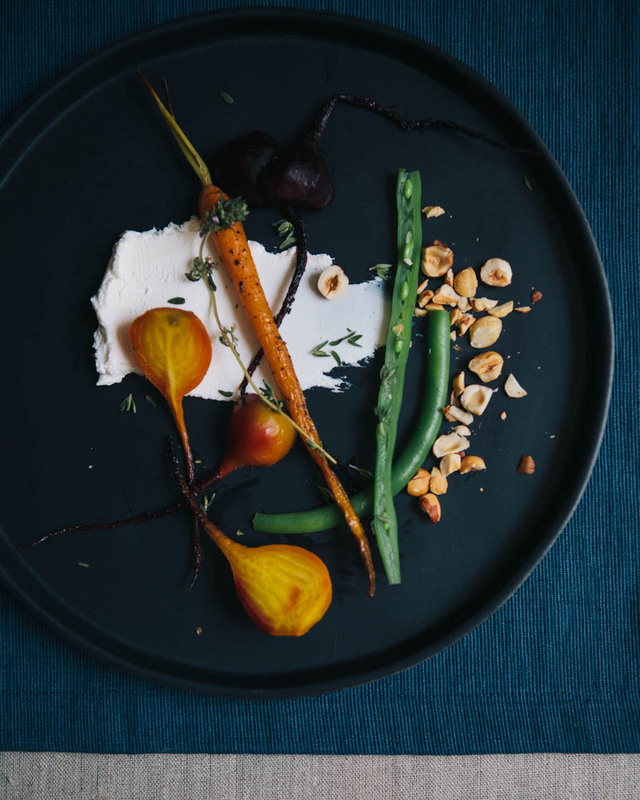 Roast Vegetables with Goat's Cheese and Hazelnuts — always with butter. Sub the beets clean, then pat dry with paper towel and place on a large sheet of foil. Drizzle with oil and sprinkle with salt. Wrap up the foil to cover the beets and roast on a baking sheet for 45 minutes or until tender when pierced with a small sharp knife (the cooking time with depend on the size and freshness of the beets; start checking them after about 25 minutes). See aside to cool. Meanwhile, lay a sheet of foil on a baking sheet and place the carrots on top. Drizzle with oil and add the white wine, butter and thyme leaves and season with salt and pepper. Cover with a second sheet of foil and pinch the edges to seal. Roast for 20-25 minutes or until tender, then set aside to cool. Scatter the hazelnuts on a baking sheet and roast for 6-8 minutes or until golden brown. Wrap the nuts in a clean kitchen towel and rub to remove the skins. Leave to cool, then crush lightly using a mortar and pestle and set aside. Cook the beans in a saucepan of boiling salted water for 1-2 minutes or until al dente, then drain and set aside. Peel the skins from the beets, then halve and combine in a large serving dish with the carrots, beans and goat's cheese. Scatter the hazelnuts and a few sprigs of thyme on top. Whisk together the oil and vinegar and drizzle over the salad, then season and serve. Reprinted by arrangement with Avery Books, a member of Penguin Group (USA) LLC, A Penguin Random House Company. Copyright © Katie Quinn Davies, 2015. So a lot of things have changed since my last post on here. Not only because that was a few months ago but because the last post came a turning point. Adam and I broke up, I had to find a new place to live, kinda start over again. So after about a week of crashing at my co-workers places I found a room to rent in St Helena. Then talked to both my jobs about working more hours so I could now actually pay this rent every month. So that is what I've been doing these past few months, working. And not much else. Doubles 4 days a week, single shifts 2 days and one day off. It's been a lot, I think it's made me in a constant state of sick too from being around all those people and not enough sleep. Plus going out to the bar after work isn't the key to good health. But everything is much better now. Of course I wish I still lived in a house with roommates I loved instead of people that I happen to share a wall with. Or I went from living with 4 animals to none which is one of the worst parts to me, my bed always feels completely empty. It is ok. I am trying to figure things out. How to make friends, how to not be a restaurant hostess for too much longer, and where to move next. Because 3 years in St Helena has crept up on me and I can't stay in this tiny town much longer. But things have finally settled down and I gone down to only 2 doubles a week and an actual 2 full days off. I'm so excited. My one day off before was about sleep and maybe running a few errands. But generally sleep. One day I didn't wake up until 4pm. So on these first 2 full days off I finally broke out my camera and made something from my new cookbook, What Kate Ate on the weekend. (I have no qualms in saying that Penguin publishing sent me this cookbook for free, to either review or cook from and post. Katie Quinn Davies is greatly talented and should get all the attention she deserves). There were lots of sweets and baking recipes at the back of the book that I would generally gravitate to. But I saw the vibrant colors of the beets and carrots and chose this one. When I was taking the photos, I kept thinking, man this needs sometime of dressing to drizzle over.....whatever. Completely forgetting to read the last line of the recipe where you drizzle the oil/vinegar over. Besides not actually reading the entire recipe more than a quick glance, it came out great.